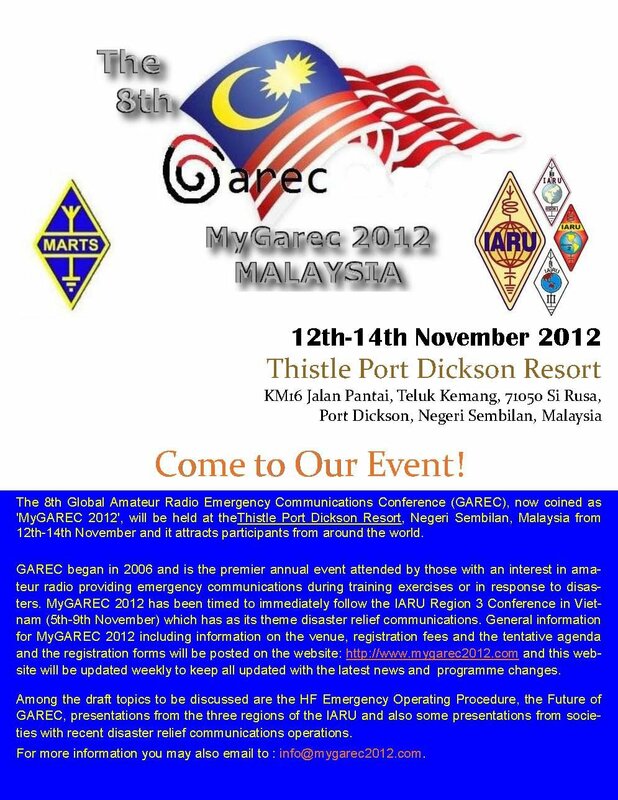 On behalf of the organizing committee, it is my great pleasure to cordially invite your society to participate in MyGAREC 2012, the 8th GAREC conference, which will be held on 12 to 14th November, 2012 in Port Dickson, Malaysia. 2. To foster more information exchanges leading towards better utilization and coordination of amateur radio resources for emergencies and disaster relief communications, gaining a closer rapport between all of the above parties and eventually developing a high level of trust and reliance on the radio amateurs for the provision of such communications services. 3. To help the relevant departments or ministries in Malaysia look more positively towards eventually becoming a signatory in the Tampere Convention and its ratification in due course. This conference is therefore an ideal forum for for all amateur radio societies whether they already have an organized emergency communications response team with ideas to share , in search of more solutions, or are in the process of setting one up and need more information and advice or simply want to learn more about the functions and roles of such teams in the amateur radio service. Some delegates from countries which have experienced recent disasters will be giving their presentations on what their society did and also share all the lessons learned from their services. Please feel free to fill in the attached registration form and return it to us as per instructions on our forms. It will be our pleasure to see you at the conference and share all our experiences and ideas. This entry was posted in NEWS, Uncategorized on 6 August, 2012 by 9m2pro.